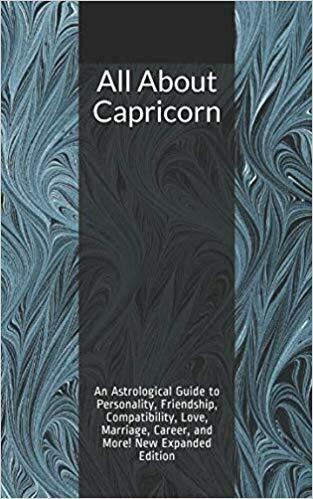 All About Capricorn, New Expanded Edition, now available in paperback and Kindle! From early childhood, most Capricorns are self-disciplined, serious, determined, mature, and able to persevere in the face of adversity. Capricorns tend to work hard and rise in their chosen fields to achieve high status and success. As a result, they often end up in positions of power, earning the respect of others rather than simply asking for it. Most Capricorns keep their promises and fulfill their obligations. They are less likely to stand people up or waste their time than those of other signs, and they have little tolerance for unreliability in others. Capricorns have good memories, both for those who have helped them and those who have harmed them. Being honorable by nature, most will repay a debt or a good deed with something equivalent or better, and some will repay a bad deed with revenge. One of Capricorn’s more appealing traits is an excellent sense of humour, which tends to be wry or dark. When Capricorns are unhappy, their wit can become sarcastic and cruel (particularly when targeting someone who has hurt them), but most of the time they are inclined to be diplomatic, preferring to avoid unnecessary conflict. Capricorns loathe embarrassing public scenes and prefer rational discourse to emotional outpourings. They behave in a dignified manner, not giving offense unnecessarily, and they loathe drama, particularly in public places. Capricorns don’t show their emotions easily for fear of being vulnerable, which can make them seem detached or even cold. They are actually quite sensitive with those they care about, though they can be ruthless in business. When Capricorns are feeling anxious or low, others rarely know it. Capricorns rarely seek help for their problems, choosing to suffer in silence instead. They find it hard to open up to other people, which makes it difficult for them to establish deep relationships, though when they do they tend to be very loyal and trustworthy friends. Capricorns can be over-conventional, afraid to break with tradition or try new things because they are more comfortable with what has proven reliable over time, and this wariness may extend to new relationships as well. They are slow to trust, and most are self-conscious and have a deep fear of public humiliation. Capricorns often suffer from low self-esteem because they are hard on themselves. Their tendency toward negative thinking and self-criticism can become full-blown depression if they’re not careful. To guard against the tendency to spiral downward into melancholy, they need to be kinder to themselves and not expect perfection all the time. Capricorns are also prone to anxiety. This trait, combined with a tendency toward cleanliness, can manifest as a germ phobia in some cases. Obsessions and compulsions are also common with this sign. Capricorns make prudent investments and they are good at earning money from a variety of sources. Unless their ascendants are in more extravagant signs, they maintain a balanced budget, save money, and invest wisely because they don’t feel safe until they’ve accumulated a large nest egg and have lots of possessions. These tendencies, combined with the Capricorn work ethic, make them excellent business partners and providers. Capricorns are drawn to the fine things in life, and they are good at gathering assets that are likely to increase in value. However, taken to the extreme, their practicality with money can tip over into self-deprivation and miserliness. Capricorns usually stay in good shape because most have the motivation and willpower required to maintain an exercise routine, and they are not inclined to overindulge. Capricorns tend to favor solo fitness activities such as running or skiing, or those that can be done with small groups of friends such as hiking (though Capricorns with more extroverted rising signs such as Aries, Gemini, Leo, Libra, Sagittarius, or Aquarius are more likely to play team sports). Regular exercise helps to stave off the negative feelings that tend to afflict this sign. Capricorns are also very active when it comes to getting things done, and they have little tolerance for lazy people. They engage in productive activities in their spare time and most devote themselves intensely to their hobbies. Capricorns don’t sit in front of the TV for hours on end unless they can do something useful while they’re watching or the program is educational. They like to be busy and usefully occupied. Many Capricorns have musical talents and if they take up an instrument, they tend to practice regularly, so they may become proficient with one or more instruments. Capricorns are the old souls of the zodiac. When young, they seem more mature and serious than their peers and tend to view children their own age as immature and seek out older companions who are more on their level. Capricorn children are usually good at amusing themselves and not bothering others. Some get picked on at school because they earn good grades or are shy and withdrawn. However, Capricorns with their ascendants or moons in fire or air signs tend to be more extroverted. Most Capricorns go through more than the usual amount of hardship, but the bulk of this hard karma tends to occur in the first half of life, as if they want to get it all over with at once so that they can move on to better times later on. Many Capricorns look younger than their biological ages as they grow older and become more youthful and laid back when they reach middle age and beyond, reversing typical ageing trends as they move from a serious, cautious youth to a more open-minded, playful, easy going old age. The sun sign isn’t the only element that influences personality. Aspects and planetary placements, particularly the moon sign and rising sign (ascendant), are also important. For example, a Capricorn with Gemini rising will be far more chatty and open, though less reliable, and with Leo rising, a Capricorn will be more assertive and prone to risk taking but less humble and sensible with money. Bugler, Ashford, Chubb, & Zapp. (1992).The Complete Handbook of Astrology.